cosyhome111 has no other items for sale. Immediate payment of £3.87 is required. It does the job fine. But, as I used the smallest one the most, I can only comment on that one. It is a bit fiddly to use and it falls apart when you have finished with it! It is easy to put back together, but you have to hold it together to use it!! 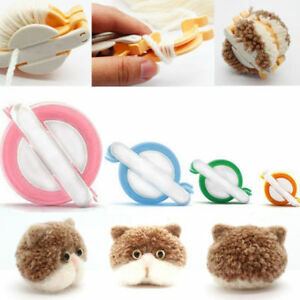 I only wish it came with an even smaller one as you have to cut a lot of wool off to get a really nice small pom pom. I have arthritis in my my hands but can use it without too much pain. Bought this set as an extra Xmas gift for my daughter . We spent ages making Pom poms Christmas Day . So easy to use and the different sizes will come in very handy to use on all kinds of projects. I’m off to buy another set for myself! !